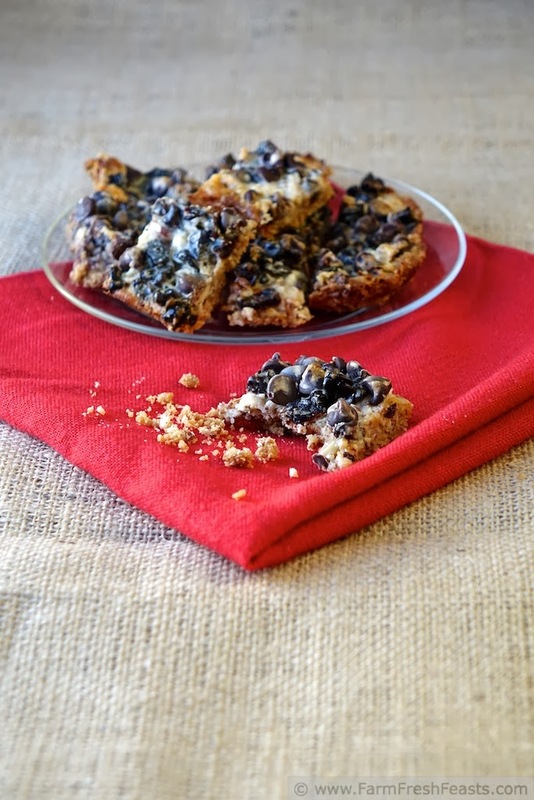 Tooth-crackingly sweet, these rich bars combine chopped almonds, dried cherries, and chocolate chips on a buttery graham cracker crumb base--perfect for you, for your Valentine . . .
or maybe just because you got your braces off . . .
or maybe because it's Friday? Sometimes, for no reason, you need to treat yourself. Sometimes you need a reason to treat yourself. Sometimes you need to treat others. Either way, these bars fit the bill. They are made with shelf stable pantry ingredients [um, plus butter] so you can whip up a batch whenever the mood, or an occasion, strikes. I had a couple of reasons to make these (primarily a band concert, but secondarily a desire to use what I've got in the pantry without venturing out into the snow and #3 [tertiarily? thirdly?] just plain having a hankering for them. I could call these Chocolate Cherry Almond Hello Dolly Bars, because growing up our family called the traditional bar cookie made with sweetened condensed milk, chocolate chips, and graham cracker crumbs Hello Dolly Bars. 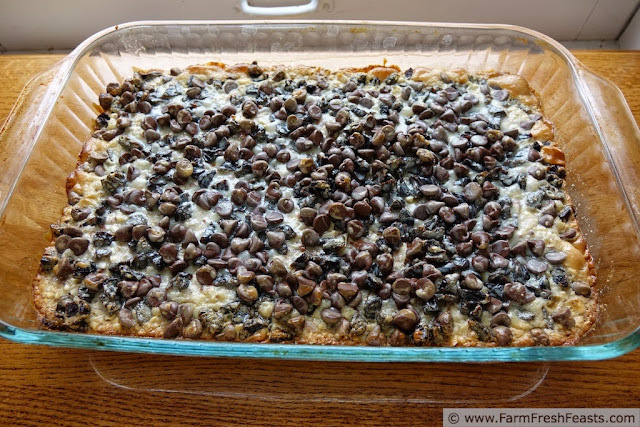 I think they may be better known, outside of my family, as Magic Cookie Bars or Six Layer Bars. I'm calling my version Chocolate Cherry Almond Magic Layer Bars to cover a number of bases. Whenever I see dented cans of sweetened condensed milk I always pick one up, because they can hang out in the pantry until I'm ready to bake. The regular, non-dented, cans work just fine as well. Because I've become a homemade granola maker, thanks to Meghan, I have giant bags of nuts in my fridge. I was looking for something Valentine-ish (because, you know, a Valentine's beet crust pizza needs a dessert) and chocolate and dried cherries seemed like a good combination. And cherries go with almonds [at least in Jergens hand lotion, love that smell] so I decided to try it in these bars. 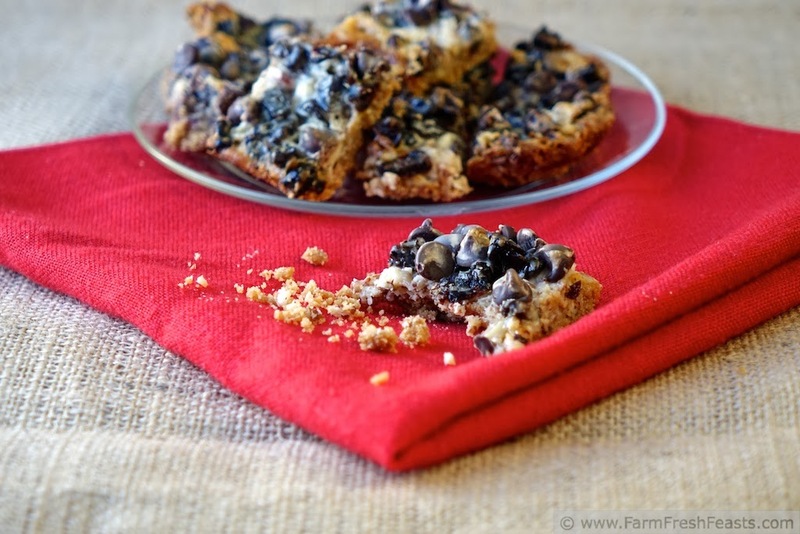 While these bars are pretty rich, the addition of the dried cherries means that I used half the amount of chocolate chips I'd usually put in a bar cookie, so there's a little fruit & fiber for ya with your chocolate. Where's my usual Friday Pizza Post?! New rules for 2014--I'm not going to go crazy trying to ensure I've got a pizza post ready to go every Friday. When I've got pizzas to share (and believe you me, I've got some pizzas to share. 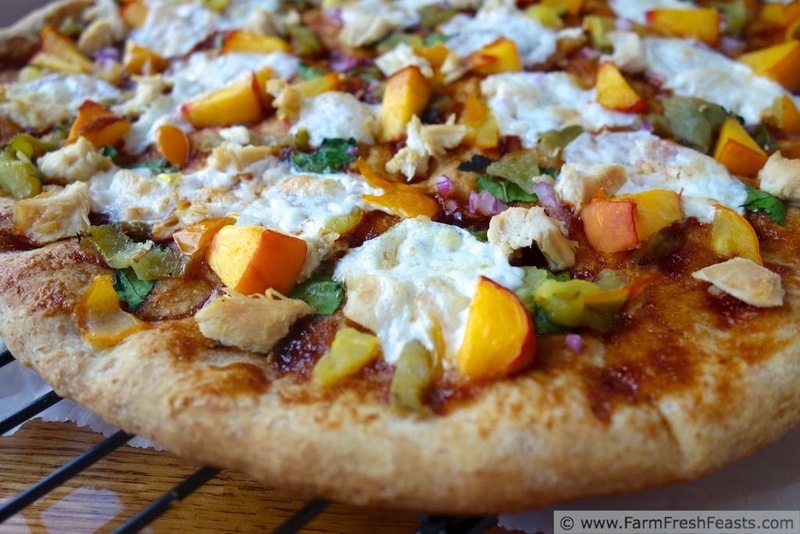 Take a gander at this Chicken BBQ Peach pizza below) I'll share them on Fridays. Like I share muffins on Monday. But I'll be mixing it up with other recipes as well. Need a pizza fix? Check out my Visual Pizza Recipe Index for ideas--I've broken my recipes down by pizza dough type, vegetarian pizzas, meat pizzas, and even fruit on pizzas--all savory, all good. Chicken BBQ Peach pizza--made last year during peach season, you can find the recipe here. Note: I have adapted the classic bar recipe from the Eagle brand® website, though I bought my dented can at the commissary and the folks at Eagle brand® don't know me at all. ANOTHER NOTE: This recipe is not gluten free as written, because I used graham crackers that contain gluten. To adapt this recipe for a gluten free diet please substitute the gluten free graham cracker crumbs of your choice. Place a stick of butter in a 9 x 13 inch baking pan and place in the preheating oven to melt. Once the butter is melted, dump the graham cracker crumbs on top and mix with a fork until the crumbs are moistened. Press down into a crust. 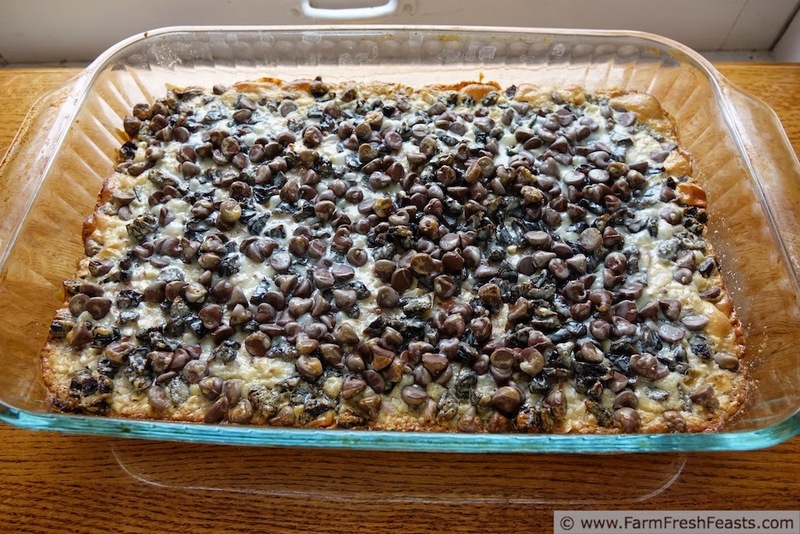 Top with almonds, cherries, and chocolate chips. 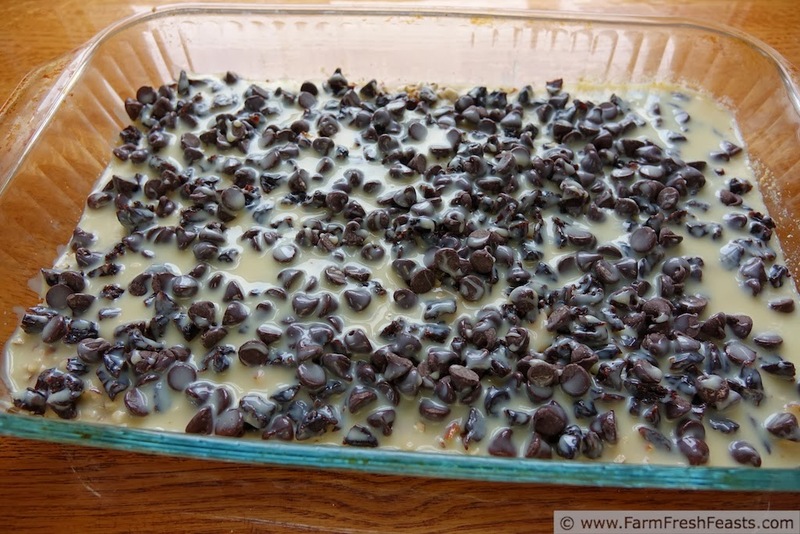 Pour most** of the can of sweetened condensed milk over the top of the chocolate chips. Use the fork to press down any areas that haven't been coated in sweetened condensed milk. Bake for 25 minutes, then cool in pan before cutting into small squares. 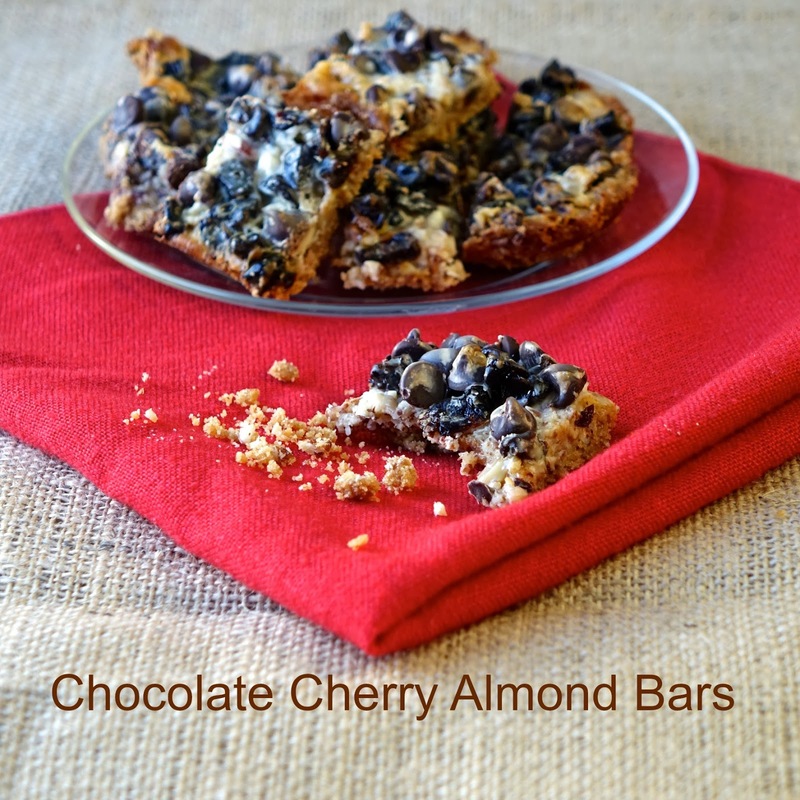 Chocolate, cherry and almond.. all the best things are in these bars! You're right--all the best sweet things (I'm getting a hankering for sautéed beet greens, fried egg, and mashed avocado which at this moment are all the best savory things to me. These sound great, I like that they are 'magic' too. I think chocolate makes everything more magical. These bars sound incredible!! I think I remember this recipe from years ago. Have a great day! The Eagle Brand recipe is a classic one, and chocolate and cherries are classic, and cherries and almonds are classic--so it just makes sense that it's a classic combination in every way. I never make "regular" seven layer bars because I'm not a fan of coconut. I can honestly say, despite my tendencies to experiment in the kitchen, I have never tinkered with that particular recipe. It never crossed my mind. Now I don't have to – I can benefit from your tinkering! Thanks, Kirsten! Take my tinkering and riff into a new direction--I'd love to see what you come up with! Yes, my son is now proudly sporting a lisp-inducing retainer. His first post-braces request was everything bagels with cream cheese, lox, red onion and capers. When I mentioned to the guys at the bagel place what Special Occasion the bagels were destined for they were quite pleased. This Hello Dolly bar thing has got me stumped--if you grew up in Texas and I grew up with midwestern/Canadian parents--how did we both end up with the Hello Dolly name? 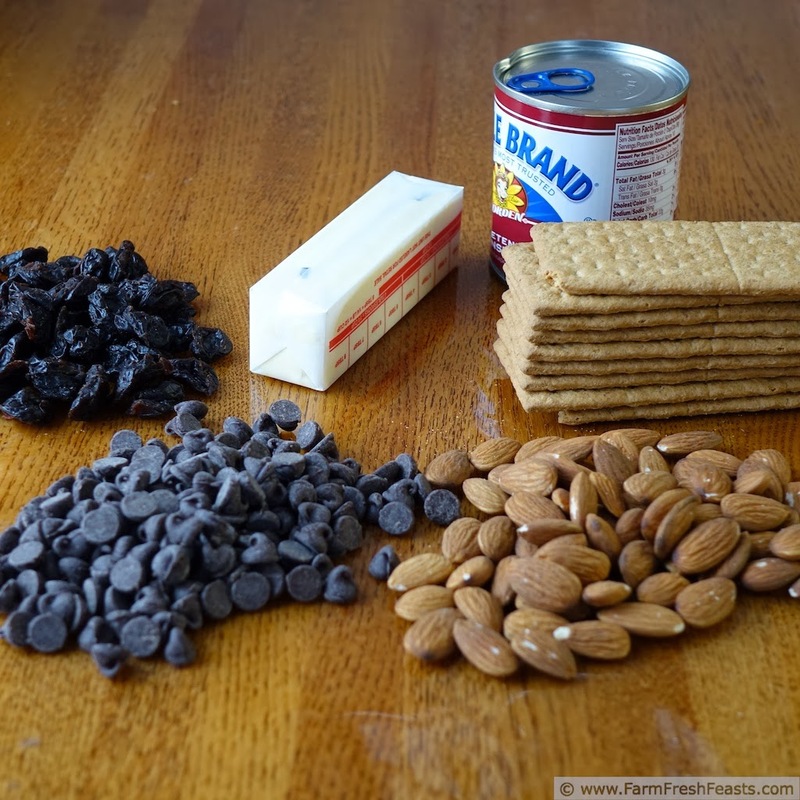 I have everything for these except the condensed milk and graham crackers. Dammit, and I never have dried cherries either, except the Hubby came home from Costco with a bag of dried cherries so now I've got to get busy. Maybe some dried cherry, chocolate, coconut granola. He also came home with bags of nuts so I can keep him in the granola way as well. I'm so glad you like making it too. Another favorite of mine (that I've yet to post) is to melt some PB on top, then add chocolate chips after it's done baking. I top it with a banana and call it The Elvis. You really need to share The Elvis. That sounds amazing. These look delicious! Thank you for linking up at Tasty Tuesdays! Your post has been pinned to my Recipes from Tasty Tuesday board. I can't wait to see what you link up next week! A small batch would be just the thing--enough to taste but since they are so rich, you're not overwhelmed. They really are. And I'm not just saying that 'cause I made them. If you made them, I'd eat them and tell you they were wonderful as well! I like your reasoning - and actually I love dried cherries, so I think I like your version even better! I think I may have everything to make them, too! I had a terrific dark chocolate cherry trail mix sample at Costco today and it's given me all sorts of ideas. Ooo these sound super decadent! Love this version & look forward to trying it - chocolate & cherries? Yes! Decadent--and you are worth it! I love your spin on these classic bars, but even more, I loved reading about your memories of sharing your condensed milk with Fred. That is at least as sweet as a Budweiser puppy & horse commercial. Thank you. Aww, shucks! I love those commercials--they tug my heart strings. I don't have any sweetened condensed milk so I'll have to wait until the blizzard is over before making these. But only an act of God as intense as this storm could keep me away from this fabulous chocolate and other good stuff bars.